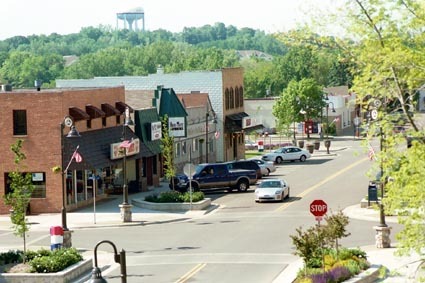 “Another piece to the downtown redevelopment puzzle is on its way, as is more downtown parking.” No, it’s not Northfield, it’s Prior Lake and the article was in the South Extra section of the Strib. The paper was reporting on the highlights of Mayor Jack Haugen’s State of the City address last week. “By the end of the year we expect to have at least one new multi-use downtown building project underway,” he said, “the building will follow the Lakefront Plaza and Rock Creek template as a quality multi-story and multi-use structure”. I really appreciated the fact that the mayor of Prior Lake was highlighting a downtown in-fill or redevelopment project in his State of the City address. His appreciation for a traditional style of commercial development warmed my heart. We are fortunate in Northfield to have a solid base of multi-story and multi-use buildings. Encouraging such in-fill or redevelopment projects, with traditional design elements, would be a great use of our leaders’ social capital. Even more heartening were his many statements about downtown parking. “We understand that we must create more parking, and soon. You can anticipate that in 2008 that additional parking will be created on city-owned property”, he said. I’d love to hear those words from our mayor or either of the downtown Councilors. Both the 3rd and Washington and 5th and Washington municipal parking lots could be turned into parking structures, as recommended by the, was it, 2000 Walker Parking Study. Taking advantage of the topography to create two-levels of parking, requiring no sacrifice of parking spaces for internal circulation, would be a great way to get more economic leverage from our existing assets. According to the Strib, a complete text of the mayor’s speech and the slide show that accompanied it can be found at www.cityofpriorlake.com/mayors_columns.shtml. It’s worth a look. What ever happened to that parking study? Has this council put downtown parking on any list? I am assuming that you are referring to the June 25, 2001 Walker Parking Consultants “Supply/Demand Analysis” with Prioritized and Priced Recommendations. Perhaps an inquiry to one of the Downtown Councilors is in order.